Male bust, cut down at the chest. The portrait features a bearded man facing the viewer. The elongated face is characterized by small eyes with heavy eyelids; irises and pupils are incised. The high and balding forehead is enlivened by a single central lock curled rightward. The rest of the hair is rendered through tiny engraved and closely arranged locks. The beard, rendered in the same manner, follows the profile of the chin. 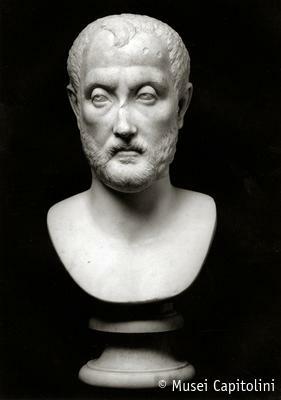 This bust is dated to the late Severan epoch.